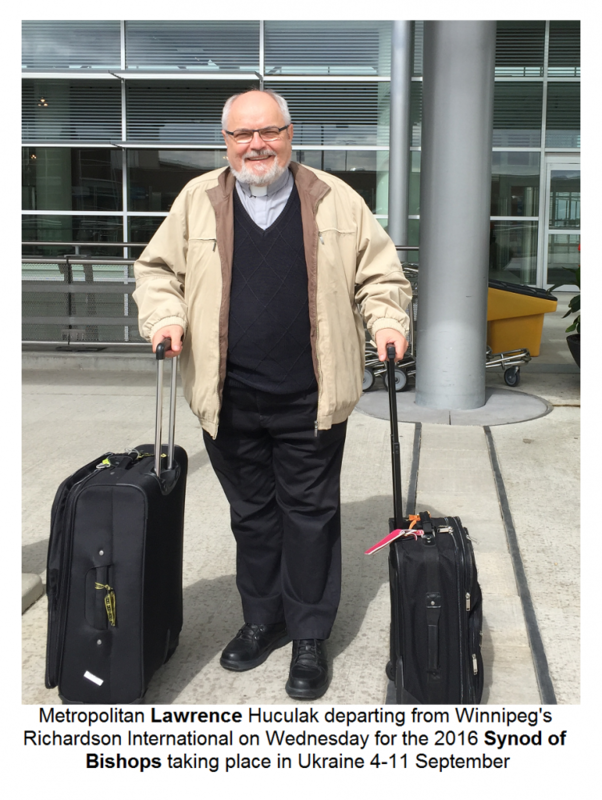 Metropolitan Lawrence Huculak left for Ukraine this week to join all the Ukrainian Catholic bishops from around the world for the 2016 Synod of the Hierarchy of the Ukrainian Catholic Church. This has become an annual event to which all bishops are summoned to participate in discussions and decision-making that will guide the Church in the coming year and beyond. The Synod is convoked and headed by His Beatitude Sviatoslav, the head of the Ukrainian Catholic Church. All bishops are invited to attend, including retired and auxiliary bishops, but all active bishops, especially local hierarchs, are expected to be present, except for the gravest of reasons. At synod, the bishops cover a wide range of topics for which they have received materials far in advance for study and consultation. The topics may range from spiritual and pastoral programs, to financial matters, to the selection of candidates, to responding to major challenges and crises. Sometimes even disciplinary matters are dealt with. The purpose of the gathering is to spend time in prayer, study and debate to make decisions under the guidance of the Holy Spirit for the greater good of the Church. At their meeting in Chicago at the end of May, the members of the Permanent Synod of the Ukrainian Catholic Church discussed the themes of the general Synod taking place near Lviv, Ukraine September 4th to the 11th. This body of four bishops together with the Head of the Church, Sviatoslav, meets on a regular basis, in between gatherings of the whole synod, to deal with matters of urgent importance. They also assist His Beatitude in governing the Church and in doing such things as preparing materials for the general synod. His Grace, Archbishop Lawrence, aside from being one of the Church’s only four Metropolitans outside of Ukraine, is one of the senior Bishops by years of service participating in the Synod. He has also taken a keen interest in the ever-developing Vibrant Parish initiative which will be a focus of the Synod. It is presumed that he will offer a full report to the clergy of the Archeparchy upon his return or perhaps a general report to a wider gathering of the Faithful as he gave at the Archeparchial Convention last year. We are all asked to pray for the success of this year’s Synod of Bishops - which concludes on Sunday, September 11th - and for the safe return of all the participants to their home eparchy.